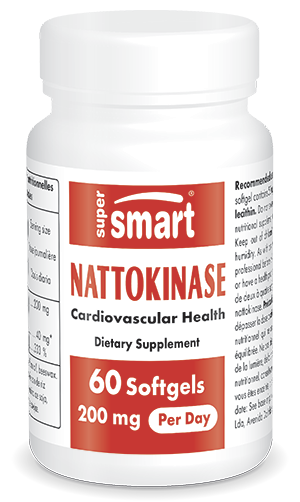 Nattokinase Nutritional Supplement 50 mg | Multiple Benefits | Suppersmart.com | Get Here! Indicated as part of treatment for hypertension. Protects against atherosclerosis due to its recognised fibrinolytic activity (preventing blood clot formation). This dietary supplement is formulated from a very specific enzyme called nattokinase, identified in the famous traditional Japanese food natto, made from soybeans fermented with the bacteria Bacillus subtilis or Bacillus natto. Despite it health benefits, this fermented food is relatively unpopular outside Asia because of its slimy appearance, ammonia-like smell and strong taste. To get round these disadvantages and make natto’s benefits available, dietary supplements have been developed from some of the active principles in this fermented food. This is the case with our new nattokinase-based supplement, isolated from natto for its cardiovascular health benefits. Consumed therapeutically for centuries, natto first became known for its high content in vitamin K2. Involved in coagulation of the blood, cardiovascular health and bone metabolism, this vitamin has been extracted from natto for several years for formulation into vitamin K supplements. More recently, scientists have highlighted the benefits of an enzyme found in natto called nattokinase. Widely-studied in recent years, nattokinase has demonstrated powerful fibrinolytic activity – the ability to regulate and prevent the formation of blood clots (thrombi). This is a significant benefit given that clots in the vascular system can lead to serious complications. As a result of its fibrinolytic activity, nattokinase is able to dissolve clots in the bloodstream and prevent the formation of new obstructions. It thus helps prevent atherosclerosis, which is characterised by the formation of atheromatous plaques due to the accumulation of fat on artery walls. As they develop, these plaques can cause a thrombosis – a partial or total obstruction of the arteries. Ultimately, this can lead to serious consequences such as a heart attack or stroke. By thinning the blood, nattokinase reduces cardiovascular complications. It also helps combat hypertension. The benefits of this enzyme are now available as a nutritional supplement. This is delivered in softgels, each containing 50mg nattokinase, with a suggested dose of between two and four capsules a day, depending on individual needs and the advice of your therapist. Alongside nattokinase, other cardio-protective effects are available in supplement form from the SuperSmart catalogue such as the protective benefits of black garlic and the efficacy of proline, for strengthening the artery walls. Each softgel contains 50 mg nattokinase corresponding to 650 FU (fibrinolytic activity units). Recommended use: Take two to four softgels a day, or as advised by your therapist.